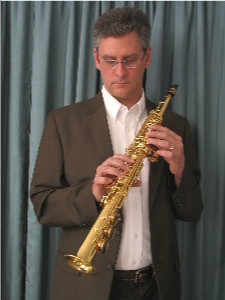 The Soprano sax is pitched in Bb and sounds a M2 below written. It gained extensive popularity in the 1990’s due to Kenny G. The sop comes in a straight configuration, but also can be found in the shape of a small alto—the “curved soprano”. It is seldom found in modern concert bands or wind ensembles. But if those groups are without an English horn or oboe, the lead alto player will pick up the part(s) on soprano. It is more likely to be found in a small jazz group. It is also very well suited for baroque solos transcribed from oboe, violin, or flute. The sop is hard to play well. Intonation is difficult even for accomplished players. And due to the shape of the instrument, technique is a little different. Right wrist fatigue is common. Wearing a neck strap when playing sop is not a sin. Many saxophonists laugh at sop players who play with a strap. But if it helps to control the horn and allow the hands to relax, who cares what they think. This sax should only be played by a mature high school or college player. Anyone younger than a junior in high school should really stay away from it. Bad habits can form quickly if the player is not careful. This is my 1998 Yamaha YSS-475. I don’t play it much, as I prefer tenor to anything else. But when I do, I stick to baroque or classical period arias or solos. I usually play these for church services, or just for my own enjoyment at home.